Darya joon I just heard one of your most beautiful songs which you sang in your recent performance in Dubai. I can only say that ” tu ma Bouleversé “. Your song, with the music of “strangers in the night” has transformed this music to a different level. The lyrics in your song is so tender, so beautiful with so much love and emotions, you sing this song so passionately. I listened to it at least 10 times over and over again and I could not stop my tears. You caress every Iranian heart with your “Angelique” voice. I had to email you and share my feelings with you. Your sweet voice of an Angel reaches every ones Soul. Hope to see you soon in Paris. May you be always Blessed in Gods Grace. من اهل همدانم وبرای تحصیل در امریکا بسر می برم به طور اتفاقی از طریق یکی از دوستان با شما و صدای دلنشین و هنر والای شما آشنا شدم ، صدایی که در این غربت غریب تسکینی بود و هست برای دل تنگ من. از انجا که در وادی هنر به اندازه ذزه ای ناچیز دویده ام از همان آغازین لحظه شنیدن هنر گرانقدر شما ،خوشحال و مسرور شدم از اینکه ملت ایزان دوباره بعد از سالها مهجوری ، می توانند از شنیدن صدا سحر انگیز شما لذت برنند و یاد یاد ها برایشان تازه شود . بنابراین بر خود واجب دیدم از شما و هنرشما تقدیر کنم و سپاس بگویم این همه زحمت شما را برای شناساندن هنر والای ایران و ایرانی به دنیا. I am preparing for my final medical exam and listening to your crystal clear beautiful voice brings the sun and the spring into this library that I am sitting in right now. The whole building is shining from within because of you! Thank you for all the beautiful energy you bring to this world. Your music fills every cell of my heart and mind with emotion, love and joy. Omidvaram ke hamishe shad o salamat bashin. Despite my many, continuous searches in the world of Persian music over the years, I am surprised I never ran into your work; well, until now! I am very glad I now did. Raised with the great works of Pari Zangeneh, I came to adore your music. What makes your music unique is you artistically blending Persian folk music into novel styles, rendering it own character. Many thanks for the purity that fills your music. Keep it like what it is, maintaining its personality just how you have grown it to date – Unique, pure, filled with the colorful Iranian folk music. I’m far away from home and family at the moment. Your Mah Pishanoo performance came up randomly among my music while I was making baghala-ghatog, it made me very emotionally aware, and I was covered with goosebumps from head to toe. Words cannot express what I feel about your work. چه خوش بختم من که امروزدر سایت بی بی سی گوهری یافتم ازایران زمین با صدائی سحرامیز واصالتی به وسعت دریا وزیبائی هم چو مهر .دختر عزیزم تهنیت شایسته تو باد که افتخار سرزمین پارس هستی دوستدار ت میان انبوهی از برف یخ در دهکده ائی کوچک با صدای ارام بخش تو تولدی دیگری یافت. Dear Darya, you are an angel with such a magical voice, you take me to my childhood memories when you sing Persian folk songs, you touch my soul with your amazing performances, you are great and I just want to thank you for all of this. I can’t wait to see you in Toronto this coming march, wish you the best dearest. For many years I have been filled with deep sorrow believing that the glorious Iranian music is moving towards an end with all legendary iranian divas already passed away and some self proclaimed artists disgracing our cultural music by producing trash every day. So you can imagine how great my joy was when I discovered your website after receiving an e-mail from a colleague containing your link. It was one of the most beautiful moments of my life to see the raise of new Iranian diva far more impressive than the ones before, and the resurrection of our Iranian music. Your voice reflects all beauties of our beloved country. As the current president of the Austrian-Iranian Medical Association I want to thank you on behalf of all Iranian physicians living in Austria for being such a brilliant ambassador of the Iranian culture. I am truly impressed by your dream voice you do have and I admired your perseverance to sing our Folk music. As a Iranin having a deep root in our culture and our traditional music, you are keeping alive our culture, our civilization, and who we are. I love your tone up and tone down in your voice which is very natural sound you are created. khanume dadvar vaghean behetun eftekhar mikonam va shoma baes shodin yekbar dige bekhatere inke irani hastam. Sedaye shuma vaghean be vosat va zolalie daryast. mesle nametoon. sedaye shuma mano be yade Lorena Mc Khanande irlandi mindaze. khaili dust daram hameie karhatuno bebinam. salamat va tandorust bashid. Man hich vaght ta hala esmetoono nashneede boodam. Faghat delam mikhad begam sedatoon va moham tar az oon nahvehe khoondanetoon bee nazeere. Bavar konid zarabane ghalbam 3 barabar tondtar mizad vaghtee be karatoon goosh mikardam. You are a true gem.You make me believe in miracles.You are an oasis to every true iranian. And when you perform i know why i breathe. It makes a 55 year old iranian man very very happy. 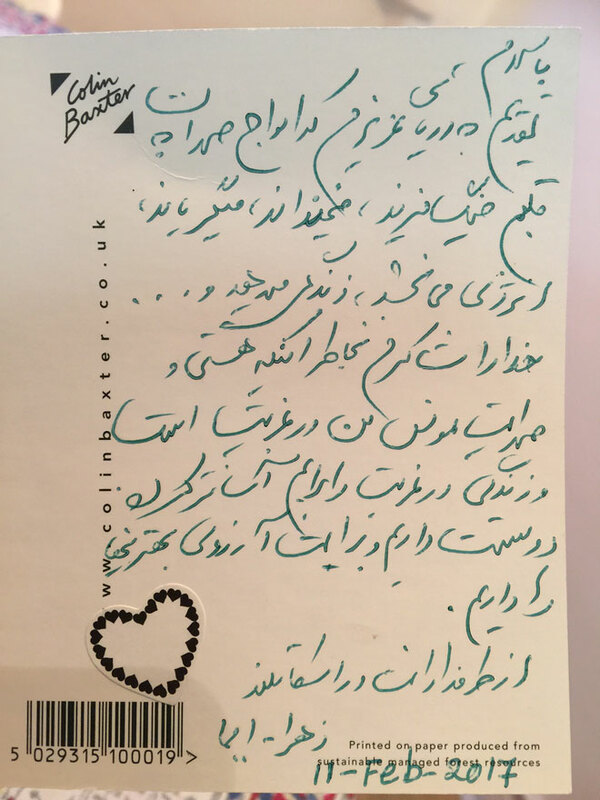 I am writing from Iran. In all these years of wandering among variety of musical pieces, i have rarely come to such an enjoyable astonishment that i came to facing your music. we love you. keep up the good job please. I can’t add anything to all the wonderful feedback that is on your website already. I will just say that your music makes my tears flow and my spirits soar. As an artist, you enlighten others’ lives; and as an Iranian, you make us proud. I wish you will go on to bless us with your beautiful art for many many years to come. I have to say that in all my years of listening to this song, I felt there was something missing, a gap between the mythic lyric of the poem and the invariably less than mythically powerful voice of the performers. Even those high on the pantheon of Persian classical music. Listening to your rendition, there is finally an Iranian singer befitting the song, a voice as powerful and tender, sweet and self-assured, graceful and grand as the lyrics. There is finally a singer whose grace of movement, whose masterful accompaniments, and whose own sheer beauty and erudition of voice and no less beauty and elegance of body, fits the mythical Iran of Ey Iran. Thank you for sharing it, and thank you for being who you are. Your performance in Toronto was the jewel in the crown of Tirgan Festival, Toronto. It was my first time to see you , and I couldn’t believe one could experience that much emotion in one concert. I cried from the bottom of my heart, screamed from the top of my lung, and I clapped so hard which got bruises in my wrist. The combination of folk, jazz, and opera was very unique and extremely effective. Mary and I wanted to thank you so very much for last night. We were going to stick around to say thank you as well, however,you seemed so busy that we didn’t want to take up her time. The concert was absolutely wonderful, and we both though you werer absolutely phenomenal. The music is such a fantastic blend, and we found it utterly moving! You have certainly created two new raving fans! Thank you again for the opportunity, it was very kind of you. Its an honour to know a wonderful artist from land of Cyrus the great .Your voice is as vast as Darya itself. Dorood bar tu ey Darya, eshgi be vosate darya dar seda shenidam, arameshi jarf o por ghoror chon darya dar negahat didam, hargez fekr nemikardam name darya betavanad inchonin barazande kasi bashad. vaghti soroodehayat ra shenidam hezar hezar afarin goftam va nemoone yek zane asile irani ra dar pishe chashm didam. Aknoon ke barayat minevisam ashke shogh amanam nemidahad, sarshar az eftekharam ke dar zamane man ham banooie shayeste tavaneste name iranam ra zende konad va eftekhar afarine melatam bashad. vaghean fekr mikonam ke hagh ra ada kardi va farhangi ra zendeh. arezoo mikonam roozi az nazdik saadate didar o shenidane sedayat ra dashte basham. sedayat rooh ra aram mikonad va khaterate khoshe kodakiyam ra be yadam miavarad, dar sedaye to va negahe zanane at mitavan zibaee zane irani ra did. Je viens à l’instant de découvrir votre talent, votre voix divine. J’ai encore les larmes en vous écrivant. (lalayi surtout pour une jeune maman que je suis…) Vous transmettez si majestueusement cette magie des mots et de l’esprit poétique persan accompagnée du timbre si limpide de votre voix que le coeur en devient un ruisseau de larmes qui coule au plus profond de l’âme pour rejoindre la MER de beauté. Qu’attendez-vous pour nous faire profiter à Paris. J’enrage d’impatience. Shenidane sedatoon mano dobare be donyaye zibaye bachegi bord. Cheghadr in seda ro doost dashtam va cheghadr goosh dade boodam .navare hasan va khanoon hana az behtarin hadayai bood ke hedye tavalod gerefte boodam .Az`khodavand omri por az shadi va salamati baraye shoma khastaram . I just discoverd gold and I realy means GOLD and that’s you. I was just blessed with a brief listening to some of your beautiful presentations, especially the song “Mah Pishanoo ماه پیشانو,” your presentation of the lyrics touched my heart. At the moment I am at a loss for words to describe how I feel. Your 2003 concert extracts on YouTube provides glimpses of joy, and your web-site’s gallery provides a bit more. It is now a very late hour here in California , and your music brought lightness to my soul. Thank you and God bless you. Hamin alan ba shoma ashena shodam, hame vojoodam eshgh shod be roohe latife shoma ke dar omghe sedatoon moj mizane. Faghat khastam bedoonin ke yek nafar ghalbesh az shenidane sedaye latife shoma larzid o jari shod. I believe you are a phenomena soloist in Persian music. As an Iranian who lives in U.S, I am proud of having such a great Iranian fellow like you. Mesmerized by your voice, and even more importantly, your personality, as an Iranian I am proud of your emergence in the international world of music and arts. I’m a 22-year-old girl living in Iran , Tehran who’s doomed to let my dreams of singing professionally and internationally be buried with me. The dream of singing like you even once in a lifetime. Just let me sincerely beg you to enjoy every single moment of your HOLY career…even in place of us. You know that so many girls in Iran -like me- dream that they were blessed enough to have the opportunity of singing… to impress human beings with this heaven-sent talent in their throats. I enjoyed your works – especially lalayi and mahpishanoo. I’m sure if we could hear angles’ voice it would be like your voice. I also admire your passion and respect to our folk music. Your voice brings beauty, happiness and hope for every-body’s life. I just wanted to tell you congratulation and tell that I’m so happy and proud of such a sharp, educated Iranian singer like you. The last word I can tell, ” Darya Dadvar is not belonging to just one nation but all nations”. مرغ خوشخوان زمانه‌ی کوچاین پرنده است که می‌خواند و راه به دریا می‌برد، یا دریاست که از گلوی پرنده سرریز می‌شود؟ شبی که پری راه شنیدن آوازهایش را نشانم داد، نه مهتاب بود و نه ماهی در خیال آن بود تا به خوابم ب‍‍یاید. رمز راه را که تقه زدم، طرحی سپید بر پرده‌ای سیاه پیدا شد که آنی به چشمم پرنده آمد و آنی دیگر پرهیبی از تصویر زنی زیبا که گمان را به ماهی سیاه چشم و سیاه مو می‌کشاند. به تلنگری بر سینه‌اش به پرده‌ای دیگر رسیدم و صدایی در ستایش دو چشم سیاه و دو موی رها در دم افسونم کرد.از آن شب بی ماه و مهتاب تا به حال هم‌چنان و هنوز ازسحر این صدای نویافته سرخوشم. صدایی که از آن پس شب‌هایی مدام در تاریک روشن تنهایی من دویده و در دواری دلنشین آواها و نواها و “ناله‌های گمشده ترکیب” کرده است. ترکیبی که گویا از کنارهم نشاندن راه و روش‌های اپرای غربی با حال و هوای ترانه‌ها و آهنگ‌های بومی شرقی به‌دست می آید اما، در نهان و در پس، از بستر هم‌آمیزی حس‌ها و زبان‌ها و فرهنگ‌های رنگ به رنگ برمی خیزد.صدا نغمه‌ی سپید‌مرغ بوم را ساز می‌کند. صدا لالایی چشم‌هایی را زمزمه می‌کند که از یاد خانه دریا می‌شوند. صدا ترانه‌ی عشق ماه پیشونو را فریاد می‌کند. صدا ناله‌ی سرزمینی را سرمی‌دهد که خنده‌اش را ربوده و رگش را گشوده‌اند. صدا از زبانی به زبانی و از گویشی به گویشی می‌سرد ومی‌غلتد تا تکه‌های تک افتاده را به‌هم‌بدوزد. صدا نرم و نازک و تند و کند از خطه‌ای به خطه‌ای می‌رود ومی‌دود تا غریبه‌با‌هم‌ها را همنشین هم کند. صدا می‌خواند و می‌خواند و نا‌همخوان‌ها را هم‌آهنگ می‌کند.این صدا که چنین گرم و گیرا لحن و کلام نا آشنا را آشنای گوش و مایه‌ها و زنگ‌های بومی را جهانی می‌کند، صدای مرغ خوشخوان زمانه‌ی کوچ است. به روزگاری که دیار حبیب و بلاد غریب به‌غرابتی باورنکردنی درهم تابیده است و رسم غرب با نفس شرق درآمیخته است، دریا ترانه‌های گوشه و کنارهای پرت افتاده و گویش‌های نا شناخته را با آوازها و آهنگ‌های بس آشنای جهان هم‌نوا می کند. آری، این پرنده دریاست که می خواند. باری، این دریا داد ور است که می خواند تا ناهم زبانی ها و ناهمزمانی‌ها را به همدلی و هم‌آوازی برساند. در خیالم صدایش را کنار صدای حوا و آمالیا و سزاریا می نشانم و گرامی‌اش می‌دارم.